Underpinning such thinking is the assumption that neither Seoul nor Pyongyang has the right to make peace on its own terms. Despite the naysaying of US hawks more interested in war than in a negotiated peace, representatives from North and South Korea met today at the border village of Panmunjom. With surprising ease, they hammered out an agreement that will allow the North to participate fully in next month’s Olympic Games in Pyeongchang, South Korea. During the discussions, which were beamed live on closed-circuit television to state officials in both Seoul and Pyongyang, Ri agreed to send what he called a “high-level delegation” to the Games, which will last from February 9 to 25. It will be the North’s first participation in the Olympics in eight years. The delegation will include athletes, a cheering squad, an art troupe, a Taekwondo demonstration team, and a group of reporters, South Korea’s Vice Unification Minister Chun Hae-sung told reporters. The North also “proposed resolving issues regarding inter-Korean ties through dialogue and negotiations for peace and unity on the peninsula,” he said. The South, in turn, proposed that the two Koreas march together for the Games’ opening and closing ceremonies (it will be the basis for the next discussion) and that they resume reunions of families divided by the Korean War (also undecided). The talks were “a New Year’s gift to the entire nation,” North Korea’s Ri said. The meeting, one of the most highly anticipated events of 2018, was the first bilateral discussion between the two sides of the Korean Peninsula since December 2015. It also marked the first direct contact between Kim Jong-un’s government and Moon, a progressive human-rights lawyer who was elected president of South Korea last May. The talks fulfilled promises Moon made during that presidential campaign, when he ran on a platform to restore bilateral diplomacy with North Korea as a way to de-escalate the conflict over its nuclear-weapons program. But his initial calls for bilateral military and Red Cross talks was rebuffed by Pyongyang, which considers him too close to Washington. The impetus for the talks came in Kim’s annual New Year’s speech on January 1, when he proposed direct discussions with Seoul “over the issue of improving inter-Korean relations by our nation itself,” with the goal to “defuse the current military tension.” Kim also welcomed the upcoming Winter Olympics as a “good occasion for demonstrating our nation’s prestige,” and said he wanted to send a delegation. Moon accepted the offer almost immediately, and days later the two countries reopened a telephonic “hot line” that was shut down by the North in 2016. Its restoration “creates an environment where communication will be possible at all times,” Moon’s press secretary proudly told reporters in Seoul. In an important step toward relieving tension at today’s talks, the North Koreans also said they had opened a separate military hotline that had been severed in a dispute over the impeached President Park Geun-hye’s controversial decision to close the jointly run Kaesong Industrial Zone just north of the DMZ. It was the last vestige of the détente-like “Sunshine Policy” that reigned in South Korea from 1998 to 2008. Although the Supreme Leader left out some of the harsh anti-US language he’s used in previous declarations, the implied threat became the story for nearly every US media outlet covering his New Year’s speech. At CNN, for example, reporter Brian Todd went on the air to warn Wolf Blitzer that the prospect of talks was dangerous because it could mask a North Korean military attack during the Olympics. In some broadcasts, Kim’s offer to talk, and Moon’s quick endorsement, were barely mentioned. Kim’s reference to his nuclear arsenal also drew a typical response from President Trump. He took to Twitter to declare that he, too, had a “button,” but it was “much bigger & more powerful” than Kim’s. His childish taunt quickly led to speculation about his state of mind and fitness to be president, a topic that dominated the White House press secretary Sarah Huckabee Sanders’s first media briefing of the year. The furor extended well into the next week, with the publication of Fire and Fury, Michael Wolff’s tell-all book about Trump that lifted his most violent threats against North Korea for its title. Someone at the White House—possibly National Security Adviser H.R. McMaster—apparently tried to shift the focus by having Trump claim credit for the apparent thaw between North and South Korea. “With all of the failed ‘experts’ weighing in, does anybody really believe that talks and dialogue would be going on between North and South Korea right now if I wasn’t firm, strong and willing to commit our total “might” against the North.” Trump tweeted. By January 6, the president was almost completely on board with the talks. Asked at a press briefing at Camp David about the potential for negotiations with Kim, he replied: “Sure, I always believe in talking.… absolutely I would do that.” Trump “appeared to be strongly indicating that he would join talks with North Korea after the high-level inter-Korean talks, if the conditions are right,” South Korea’s liberal Hankyoreh concluded. Meanwhile, after Moon and Trump discussed North Korea’s offer during a phone call, the two governments agreed to delay joint military drills during the Olympics. The temporary halt had been a key demand of South Korea, and helped improve the atmosphere for the upcoming talks with Pyongyang, which notified South Korea that it would join the talks after the halt was announced, according to Yonhap News Agency. But this was definitely not the view in DC, where pundits quickly coalesced around the conventional wisdom that the talks would inevitably divide Washington and Seoul and split the US-Korean military alliance. In the week leading up to Tuesday’s talks, the US media were filled with speculation from former US officials that South Korea was walking into a clever trap laid by the North. The pace was set early on by The New York Times, in a front-page story on January 1 posted literally hours after Kim’s New Year’s speech. It instantly became the leitmotif for media coverage throughout the week. Behind Kim’s New Year’s declaration “lies a canny new strategy to initiate direct talks with South Korea in the hope of driving a wedge into its seven-decade alliance with the United States,” reported Choe Sang-Hun and David Sanger, the latter a recipient of dozens of US intelligence leaks about North Korea over the years. Like Trump’s initial tweets claiming credit, it was as if the South—which first opened unification talks with the North in 1972 and has had two summit meetings in Pyongyang, in 2000 and 2008—has had no experience at this. In the Choe-Sanger article, the Times cited Robert Litwak—a senior vice president at the Woodrow Wilson Center for International Scholars who is well-known in Japan and Korea for his hard-right views on security issues—to back its claim that Kim is seeking to “take the side of the South Koreans, against President Trump.” He was then given a large block of space on the Times’s January 3 op-ed page to spell out his grave concerns for the wayward South Koreans. At the UN, US ambassador Nikki Haley flatly dismissed the potential for progress. “We won’t take any of the talks seriously if they don’t do something to ban all nuclear weapons in North Korea,” she said. Gen. Vincent Brooks, the commander of the 28,500-strong US Forces Korea, chimed in from Seoul with an admonition to South Korea not to have any illusions about North Korea. “We must keep our expectations at the appropriate level,” he cautioned in a public speech. Under the current structure of the US-South Korea Joint Command, Brooks would command the entire South Korean army if a war broke out. Underpinning such thinking is the assumption that neither South nor North Korea has the right to make peace on its own terms. This was spelled out in remarkably candid admissions to the Times’s Mark Landler from two key figures in the historically bipartisan policy on Korea. They are Michael Green, a top Asia adviser to President George W. Bush who was on the 2002 delegation to Pyongyang that killed the 1994 nuclear agreement with North Korea, and Daniel Russel, the former assistant secretary of state for East Asian and Pacific affairs in the Obama administration. In a story titled “As North and South Korea Begin to Talk, Trump Watches From Sidelines,” Green—who is senior vice president and Japan chair at the Center for Strategic and International Studies, where his responsibilities include CSIS projects on the two Koreas—declared that the North-South talks somehow created a “dilemma” for the Trump administration. Later in the day, Axios posted a story based on the Journal’s report that hit the Internet at almost the exact moment the Panmunjom talks began. Yet despite the clear signals of disapproval from US hard-liners, the Moon and Kim governments pressed on, saying they would soon embark on “working-level” talks to discuss the details of the North’s participation in the Olympics, the family visits, and “solve bilateral issues among themselves without relying on outside” forces, according to the Joongang Daily. “This positive atmosphere raises hopes that if South and North can harness their wisdom, these talks may be a chance to break the vicious cycle of hostility and move toward peace on the peninsula,” Hankyoreh proclaimed. In a commentary published Tuesday, North Korean state media tweaked the US attitude toward the talks, according to CNN Korea correspondent Will Ripley. The “U.S. should properly choose between the two things: whether it would continue [a] military standoff with [North Korea] to meet its end or peacefully coexist,” the editorial stated. Dates for the next round of talks are not set. 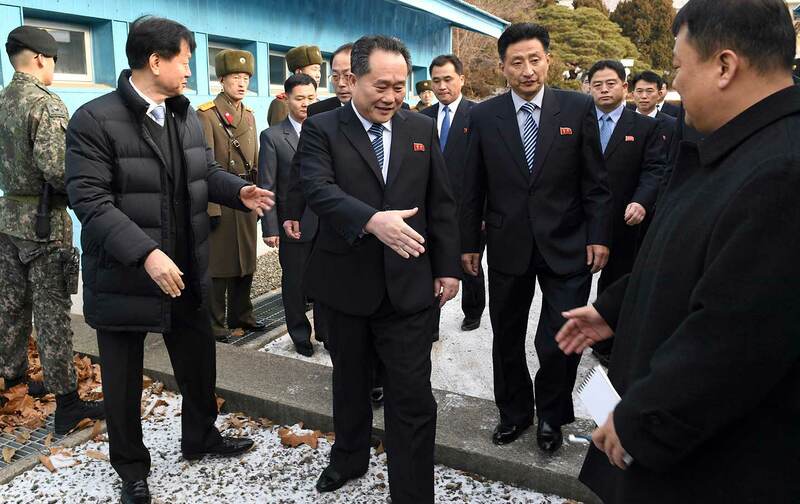 To allow some higher-level North Korean officials to attend the Olympics, Moon’s foreign ministry said Seoul may consider easing some of its sanctions imposed on Pyongyang. That could easily set off another round of acrimony with US officials and Korea hard-liners in Washington.